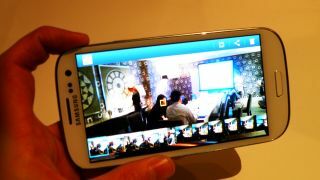 The new Samsung Galaxy S3 smartphone will arrive capable of hitting the fastest 3G speeds currently on offer in the UK. The 4.8-inch, quad-core device is DC-HSPA (dual channel high speed packet access) enabled meaning that some O2 customers will be able to reach download speeds of up to 42Mbps. O2 is currently rolling-out the upgrade to its 3G service, in the major UK cities, as Ofcom continues to drag its heels over the long-awaited 4G LTE auction. Vodafone is currently the only other UK network offering DC-HSPA connectivity, but can only promise a maximum speed of 28Mbps. Rivals Three and Everything Everywhere are also promising to upgrade their offerings later this year with both aiming for the maximum 42Mbps speeds. The Samsung Galaxy S3 will arrive as one of an elite crew of gadgets currently packing the improved connectivity. The iPad 3, which earned the company criticism for its '4G' claims, and the Nokia Lumia 900 Windows Phone device are among the others. The Galaxy S3 officially arrives in the UK on May 30th, although fans eager to get their hands on the device can do so one day earlier at the Samsung Store in the Westfield Shopping Centre, London.